The chilly winter months are often known to be a difficult time of the year for selling a home. While November and December may be slow for selling, the next two months are the perfect time of year for enhancing the curb appeal of your home as a charming winter residence. Make the most of holiday decor and landscape lighting to warm up the appearance of your home during the chilly weeks of winter. 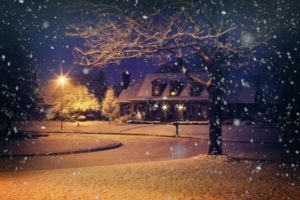 As you are preparing to sell your home in winter months, consider these easy tips for adding curb appeal to your home as you sell this winter. Your landscape is a crucial aspect of your home appearance at any time of year. However, the winter months are especially important to invest in some landscape maintenance for your home exterior. Show off the best of your property by polishing your landscape, including trimming trees, cleaning your hardscape, and maintaining your flowerbeds. Not only will simple holiday decorations add a fun and festive look to your home, but they will also help to tie together the clean and colorful elements of your home exterior. A simple wreath or a small amount of festive garland can go a long way for enhancing the curb appeal of your home. By repainting your shutters and outdoor features, you are giving an instant facelift to your home exterior. Let a fresh coat of paint highlight your beautiful outdoor space with colorful shutters and a freshly painted fence. With a new coat of paint, your home will look instantly updated for a potential buyer. Warm up the winter appearance of your home during evening hours with simple and beautiful landscape lighting for your home. Whether you light the pathway leading to your door or the perimeter of your garden, a warm glow will instantly enhance the curb appeal of your home on a winter night. This entry was posted on Friday, November 16th, 2018	at 9:50 pm	and is filed under Residential Sales	. You can follow any responses to this entry through the RSS 2.0	feed. Both comments and pings are currently closed.